Complex machine designs need continuous, real-time input from every project stakeholder. Incorporating customer feedback upfront can slash manufacturing costs and speed up production times. Sharing design data securely and gathering feedback in real time is not possible with old file-based CAD. 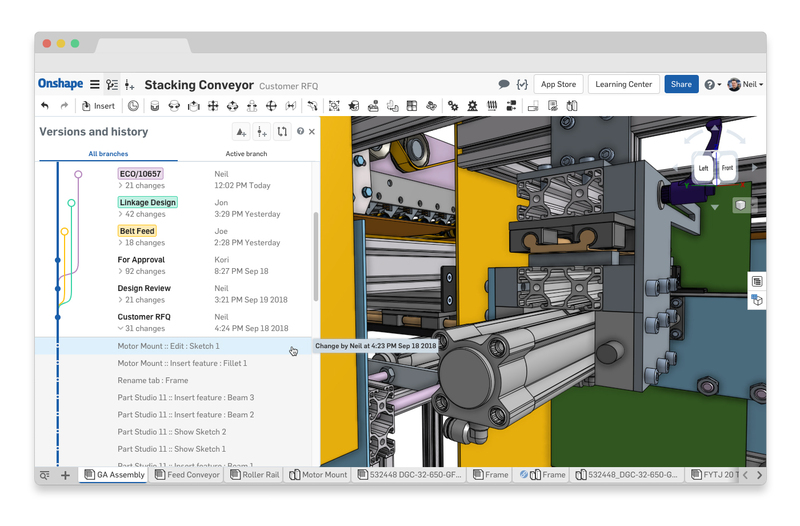 Onshape stores your machine designs in one central location, providing instant access to the latest project data. Real-time design reviews, commenting and simultaneous editing enable a true collaborative workflow where everyone’s input can be captured, recorded and implemented into the final design. Building modular, multi-purpose machines allows for the flexibility to switch product lines quickly, and results in standardized machine designs and reduced development costs. For flexibility in modular design to be successful, it requires the collective insights of your most talented engineers. 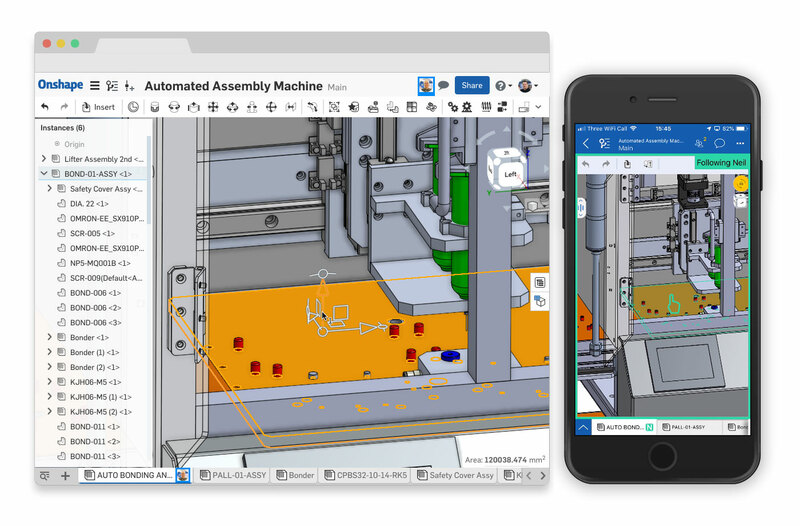 Onshape’s built-in data management enables every engineer to explore new design scenarios, using the same baseline data, without affecting each other's work. Every edit and every design change is recorded, so your team can experiment with confidence. Errors and bad design decisions are easily undone, while the best ideas can be merged back into the main design. Machine speed is a common benchmark many customers use when choosing a machine supplier, but cycle times are meaningless if the quality of the end product is compromised. Since unplanned downtime can cost thousands of dollars per minute, accuracy and attention to detail are the most important factors when designing a new machine. 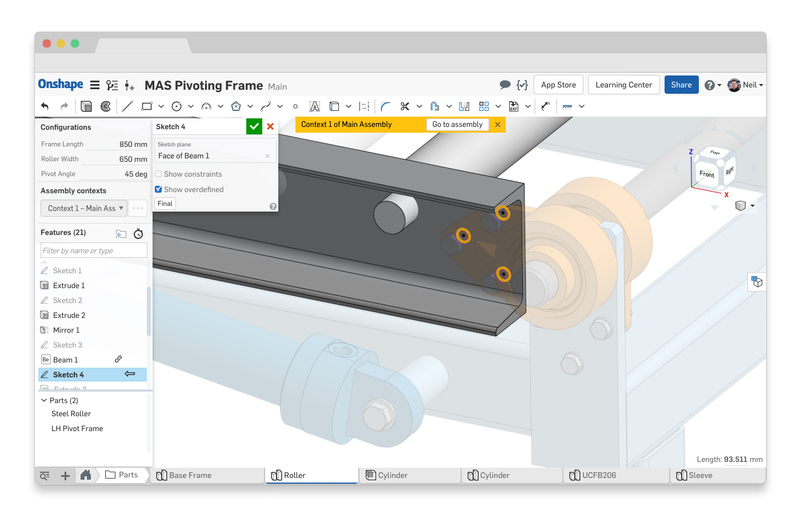 Onshape’s unique architecture enables related parts and subassemblies to be designed together, capturing design intent and ensuring that every part updates predictably when changes occur. Design data is always up to date, so when a colleague makes a change, the entire team instantly knows about it. Errors are reduced and every part fits together perfectly – the first time. Sometimes when I use Onshape, I wonder why CAD systems didn’t work like this before. It’s like when I listen to Spotify, I think, ‘Why didn’t we have this before instead of collecting CDs that we’d just want to throw away in a few years? I don’t know. We simply did it that way because that’s the way it was. Getting accurate part information to our engineers, designers, management and the manufacturing vendor is crucial. Previously, out-of-sync information had led to incorrect parts being manufactured. Onshape now enables us to share information quickly and ensures that everything is as accurate and as up-to-date as possible. This reduces the risk of human error. I haven’t used a file-based CAD system yet that hasn’t crashed on me, especially in the concept-generation stage. I’ve never lost work in Onshape and I never have to remember to hit the save button. At this point, it would be a struggle to return to our old CAD system.